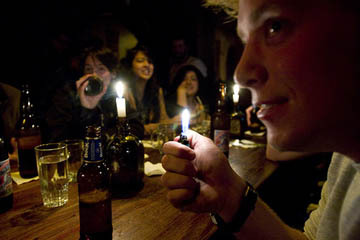 Cocaine Bars: A Latin American Adventure or Playing with Fire? Route 36 has turned La Paz, Bolivia into a hotspot for drug tourism, tempting backpackers from all over the world. But is it a good idea? ‘Drug tourism’ is going mainstream. Don’t believe me? Do a quick Google search for “Route 36 La Paz, Bolivia“. Touted as “the world’s first cocaine bar” this lounge, which has to change locations frequently, serves up lines of blow alongside cocktails. I’ve seen people doing lines right off the bar in dives up in the remote Andean pueblitos of Peru in 2003, so I assure you, Route 36 is not the first, but perhaps the first to advertise it. Drug bars could be the thing Bolivia needs to jump-start tourism, although, if I walked into Route 36, I think I’d stick to cocktails. Any gringo who sits comfortably in front of a mirror at a public bar in Bolivia is asking for trouble. Although Latin America is moving towards a new strategy on drugs, you have to remember that in a country with military police, you have zero rights. Bolivia is poor, and so are its soldiers and cops. If someone felt like it, they could walk in, drag you out of the bar and take you to the nearest bank to empty out your checking account at the ATM with the alternative of throwing you straight into a Bolivian prison. This is a common move in Colombia. No probable cause; no search warrant; no problem. I had a couple soldiers search me in Taganga, Colombia down to taking every credit card out of my wallet. If I had a bag of anything on me, they would have found it. Given the fact that “Route 36” is now world famous and mentioned in mainstream blogs and newspapers, it won’t take long for tactless tourists to blow up their spot and for some shady cop to see how he could capitalize on the situation. If you want to experiment with coke a little closer to the source, before it’s been stepped on 16 times, I would recommend finding a friend and making sure you can trust them. Even then, you’re taking risks that should not be taken lightly. Being caught with hard drugs in a poor country can be more than just a minor bump in the road. What do you think of the cocaine bars? Share your thoughts in the comments! The best way to stay safe is remember what 80’s cartoons taught us: and just say no to drugs. Consider 5 Legal Ways To Get High While Traveling. But if you still want to indulge, check out Tripping Out On The Road.